Do you have major regrets in life? Or just some minor faux pas you could kick yourself for committing? Or is it something you didn't do in life that you regret? This fascinating book lets you into the secrets of a wide range of people who have achieved fame or success, all of whom have generously agreed to open their memories and look back. 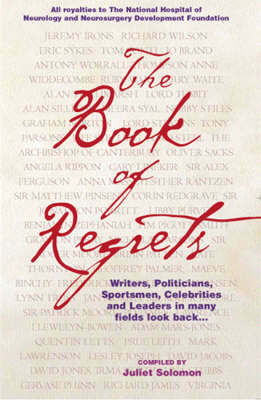 From regretting not running off with a neighbour's wife, to not taking toilet paper on an expedition to the North Pole, from not losing weight forever at twenty two, to regretting a careless remark made while giving a military briefing to journalists in Iraq, people's regrets vary enormously. There's the best-selling novelist, for instance, who can't forgive himself for bottling out when appearing for charity on "Who Wants to be a Millionaire?" and not having the courage of his convictions, and there's the famous talk show host whose wife won't forgive him for turning down an invitation to dinner with Clint Eastwood!Then, by contrast, there's the now famous Australian cricketer who regretted not ever having had the chance to bowl at the great Donald Bradman (only to be told by the Aussie captain to whom he voiced this regret, that everyone got one lucky break in life and this was his! ). From witty one-liners to epic sagas, from childhood memories to thewisdom of old age, there is much here to laugh at or be moved or surprised by. All royalties from this book will go to the National Hospital for Neurology and Neurosurgery, which has helped so many to rebuild their lives and regain the opportunities that are too often taken for granted.